Bring temporary power distribution wherever you need it with Transformer Carts (TC) from BHS. The TC is designed to carry, support, and protect transformers and distribution boxes within a single unit. This provides portable temporary electrical power to hard-to-reach areas. Along with large casters to handle slightly uneven terrain, BHS Transformer Carts come stock with integrated fork pockets. This allows transportation across any terrain with a suitable lift truck or tractor fitted with forks. The cart’s thin profile allows it to pass through standard doorways and narrow aisles without sacrificing durability. When equipment absolutely must have access to power, the TC provides safe and reliable transportation for vital electrical equipment. These units feature heavy-duty steel construction and a powder-coat finish that resists scratches, rust, and chemicals, making these units ideal for industrial applications. The fork pockets and an easy-steer combination of rigid and swivel casters simplify transport, and a standard electrical strut channel accommodates virtually any panel. Custom sizing, weight limits, added features, and configurations are all available. 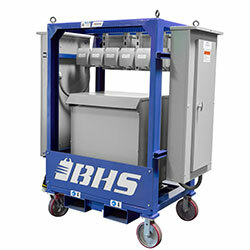 Contact BHS to discuss Transformer Carts that provide the perfect solution to your power-distribution challenges. To learn more about how Transformer Carts and other Electrical Equipment from BHS can improve working conditions in your business, call our sales team at +1 314 423 2075.